View all articles of EFFL 1/2019 HERE. Since 2006 EFFL serves the needs of food and feed law experts by providing a unique platform to extract, elaborate and exchange their specialist knowledge and best practices. The law journal thus unknots the growing web of national, European and international food and feed rules and regulations, which are studied in bi-monthly contributions by legal scholars, scientists and experts from other relevant disciplines. The purpose of EFFL is not only to generate and disseminate information related to food and feed law from relevant national, European and international sources; but also to analyse and evaluate important past and contemporary legal and policy developments in this sector. EFFL gathers legal and scientific expertise from academia, policy and practice in and beyond the European Union, the law journal is therefore best known for offering an inclusive forum to present and ponder the collected knowledge and best practices in terms of food and feed law. compliance with European and international food and feed law. To guarantee EFFL’s high-quality standards, all submissions are required to conform to the author guidelines. EFFL offers an intellectual forum for jurisprudence led by experts in the field of food and feed law. It addresses businesses, lawyers, academics, courts and public administration in the EU and beyond. EFFL’s editorial board consists of members from a number of European countries, relevant international organisations and institutions; likewise EFFL benefits from the expertise of its many country correspondents across Europe and beyond. The law journal contains in-depth specialist articles scrutinising relevant legal concepts and practices; comments on recent judgments and decisions; national reports on important developments in the Member States; and references to new legislation, jurisdiction, notifications to the European Commission under Directive 2015/1535, new publications and MEP’s questions and answers. We are glad to present issue 6/2018 of the European Food and Feed Law Review, where leading practitioners and academics from around the world discuss the most relevant topics in the field. This issue of EFFL covers a proposal on the classification of food ingredients with technological properties, online food regulation in China, the EU laws on vegan and vegetarian claims, and food traceability in China. We also bring a presentation of the newly-formed European Commission Knowledge Centre for Food Fraud and Quality. Our regular sections on new publications, legislation, jurisdiction, notifications per EC Directive (EU) 2015/1535 and European Parliament Q&A comes rich with the latest information in the field of Food and Feed. EFFL 6/2018 also features the latest developments in Belgium and Luxembourg, Czech Republic, Denmark and Italy. View all articles of EFFL 5/2018 HERE. We are glad to present issue 5/2018 of the European Food and Feed Law Review, which brings bold discussions by leading practitioners and academics from around the world. This issue of EFFL tackles the classification of technologically enhanced foods, fake news in the food industry, the EU Regulation on novel foods, organic farming law reform in the EU and farmer’s rights in light of industrial farming practices. Our regular sections on new publications, legislation, jurisdiction, notifications per EC Directive (EU) 2015/1535 and European Parliament Q&A comes rich with the latest information in the field of Food and Feed. EFFL 5/2018 also features the latest developments in Austria, Bulgaria, Italy, and Norway. View all articles of EFFL 5/2018 HERE. We are glad to present issue 4/2018 of the European Food and Feed Law Review, which brings bold discussions by leading practitioners and academics from around the world. 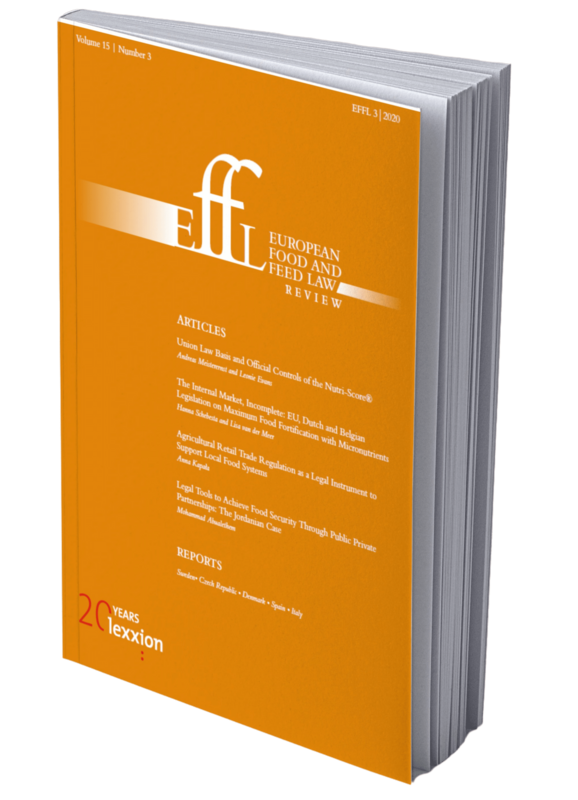 This issue of EFFL has two articles on the intriguing topic of insects as food (a practice also called entomophagy), with thorough analyses on its regulatory, historical and social dimensions; also featured are articles on current food e-commerce regulation in China and the labelling of dairy products in the EU. Our regular sections on new publications, legislation, jurisdiction, notifications per EC Directive (EU) 2015/1535 and European Parliament Q&A comes rich with the latest information in the field of Food and Feed. EFFL 4/2018 also features the latest developments in Denmark, France, The Netherlands, Poland and the United States. View all articles of EFFL 4/2018. The latest issue of the European Food and Feed Law Review offers analysis and insights into some of the most pressing issues in the field. EFFL 3/2018 includes articles on the issue of pest management in food processing plants, flexibility principles in food safety in the EU and the protection of EU Geographical Indicators in Ukraine. In addition, the issue features reports on the latest developments in the food law space from Denmark, Czech Republic, Italy and the United Kingdom. View all articles of EFFL 3/2018. EFFL 2/2018 addresses several important contemporary topics such as IP in the food sector, correct labelling (‘vegetarian’ and ‘vegan’) and the Commission Regulation on “Total Diet Replacement for Weight Control Products”. Read also an thorough analysis of ECJ Judgment in case C-56/16 P Port Charlotte II elaborating on the Regulation on geographical indications of wines. On top of that, the issue contains an article on policies adopted in terms of biosafety in Indonesia. Country reports from Italy, Norway, Romania and Spain offer insights into crucial national developments in the field of food and feed law. View all articles of EFFL 2/2018. EFFL 1/2018 kicks off the New Year scrutinising relevant contemporary issues in EU food and feed law: ‘Quantitative Allergen Labelling’, ‘Financing of Official Controls’, ‘The EU’s GMO Concept’ and ‘Health Claims and Botanicals’. Moreover, it offers an in-depth annotation of Queisser (C-282/15 ) and Noria (C-672/15), alongside concise country reports on important national developments in Belgium, the Czech Republic, Denmark, the Netherlands and Poland. EFFL remains committed to keep you informed about the latest legislation, jurisdiction, notifications, MEP Q&A and publications. Read all articles of EFFL 1/2018. Become an Author for EFFL and view our Call for Papers. After the manuscript is submitted it will undergo the process of peer review where the accuracy, quality and relevance of the text will be evaluated. Submission of a manuscript does not imply claim for publication. Responsibility of the factual accuracy of a paper rests entirely with the author. The manuscript must also be complete and final in terms of formulation and factual information so that no major corrections – only of type-setting errors or the like – will be necessary after type-setting, when an edited version will be returned to the author. Subsequent requests for corrections cannot be processed. Upon submission, authors commit to adhering fully to these guidelines, Lexxion’s Terms and Conditions and Publication Ethics and Malpractice Statement, available below. Articles should be around 3,150-6,300 words in length, i.e. 20,000–40,000 characters with spaces, and must be sent in MS Word Format, single column, Times new Roman, font size 12, line spacing 1 ½. They are to be submitted in British English. All images and tables must have a descriptive title (up to 10 words) and be mentioned or referenced in the body of the text (along with any applicate footnote. Footnotes should never be placed in the titles). An image or table cannot be larger than 1/3 of a page, unless it is to be printed as a separate appendix. In no circumstance can they be larger than a single page. Bigger images and tables should be broken down. Table contents and titles cannot contain footnotes! Images must be sent in separate graphics files (such as .png) in high resolution and in greyscale (printing in colour is not possible). All citations and references must be in footnotes only ; final bibliographies and endnotes are not accepted. They must be inserted using the automatic references function in MS Word. >author’s first name and last name (name of all authors; if more than 4 authors, list 3 authors then et al. )<, >book title< (in italics), >edition or number of volume< (if applicable), >(place: publisher and year of publication)< (in parentheses), at p. >page number< (or for several pages pp. >page numbers<, followed by et sqq. if needed). Example: Patricia Birnie and Alan Boyle, International Law and the Environment, 2nd ed. (Oxford: Oxford University Press 2002), at p. 24. >author’s first name and last name<, “>article title<”, in >editor’s/editors’ first name and last name/s< (ed./eds. ), >volume title< (in italics), >(place: publisher and year of publication)< (in parentheses), pp. >starting page number< et sqq., at p. >cited page number<. Change and U.S. Law (Chicago: ABA, 2007), pp. 31 et sqq., at p. 34. >author’s first and last name<, “>article title<”, >journal volume, title (in italics) and year (in parentheses)<, pp. >starting page number< et sqq., at p. >cited page number<. Example: David Freestone and Charlotte Streck, “The Challenges of Implementing the Kyoto Mechanisms”, 15 Environmental Liability (2007), pp. 47 et sqq., at p. 48. Commonly used journal titles can be abbreviated. (2007), pp.29 et sqq., at p. 33. >author’s first name and last name (name of all authors; if more than 4 authors, list 3 authors then et al. )<,>“thesis title”<, >Ph.D./LL.M./M.Sc.< thesis on file at the University of >university name<, >year of defense< (in parentheses), at p. >page number< (or for several pages pp. >page numbers<, followed by et sqq. if needed). 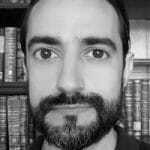 Example: Nick Farnsworth, “European Emissions Trading: State Aid and WTO” (LL.M. thesis on file at the University of Leuven, 2004), p. 15. >presenter’s first name and last name<, “>presentation title<”, presentation held at >name of event, place, date<. source<, >date<, at p. >cited page number<. Example: John Friedman, “The Crisis in Bolivia”, New York Times, 17 March 2005, at p. A2. accessed on >date<) (in parentheses). <www.icao.int/cgi/goto_m.pl?icaonet/dcs/8632.html> (last accessed on 25 March 2008). (1998), pp. 22 et sqq. Protocol, UN Doc. FCCC/KP/CMP/2005/8/Add.1, 30 March 2006. Reports (1997), pp. 1 et sqq., at p. 75. Appellate Body, WTO Doc. WT/DS58/AB/R, 6 November 1998, at p. 153. Example: Case C-179/90, Merci convenzionali porto di Genova  ECR I-5889, at para. 57. Example: Opinion of Advocate-General Tizzano in Case C-53/00, Ferring v ACOSS  ECR I-9067, paras. 18-22. Example: Commission Regulation (EC) No 69/2001 on the Application of Articles 87 and 88 of the EC Treaty to De Minimis Aid, OJ 2001 L 10/30. Example: Council Directive 75/439/EEC on the Disposal of Waste Oils, OJ 1975 L 194/23. Chronopost, OJ 1998 L 164/37. Example: Commission Proposal for a Directive of the European Parliament and of the Council Amending Directive 2003/87/EC so as to Improve and Extend the Greenhouse Gas Emission Allowance Trading System of the Community, COM(2008)16, at p. 13.
question; where in doubt, apply the same principles reflected in the foregoing guidelines. or infra) to the location of the full reference and the page number of the reference. Krämer, E.C. Environmental Law, supra note 15, at p. 68. Lefevere, “Emissions Allowance Trading”, supra note 12, at p. 176. Kyoto Protocol, supra note 23, Art. 12. – Preceding preferences should be cited as “supra, note 90”. – “Ibid.” should only refer to immediately preceding preferences. – “$”, “€”, “£” instead of “Dollar”, “Euro”, “Pound” etc.